Bravo! 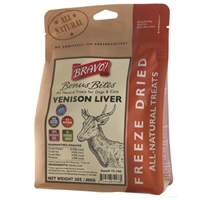 Freeze Dried Venison Liver, 3 oz. Bravo! 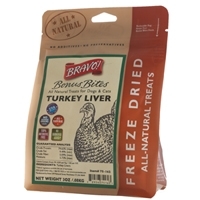 Freeze Dried Turkey Livers - 3 oz. Bravo! 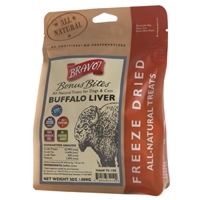 Freeze Dried Buffalo Livers - 3 oz. Absolutely no additives, preservatives, coloring or artificial flavoring. A natural source of Omega 3 fatty acids, protein, natural vitamins and minerals. Made from only Wild Pacific Herring with no by-products fillers or rendered materials. Absolutely no additives, preservatives, coloring or artificial flavoring. A natural source of Omega 3 fatty acids, protein, natural vitamins and minerals. Made from only Wild Pacific Whiting with no by-products fillers or rendered materials. Absolutely no additives, preservatives, coloring or artificial flavoring. A natural source of Omega 3 fatty acids, protein, natural vitamins and minerals. 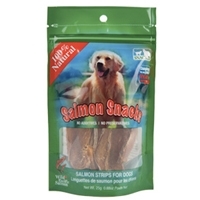 Made from only Wild Pacific Salmon with no by-products fillers or rendered materials. 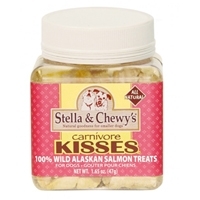 Stella & Chewy's Carnivore Kisses Freeze Dried Salmon Treats 2.75 oz. Want to do something special for your pet? Surprise her with Carnivore Kisses Treats. 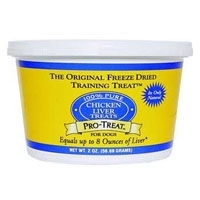 These diced, all-meat treats are available in 100% Angus Beef, 100% Chicken, 100% Duck, and 100% Wild Alaskan Salmon. 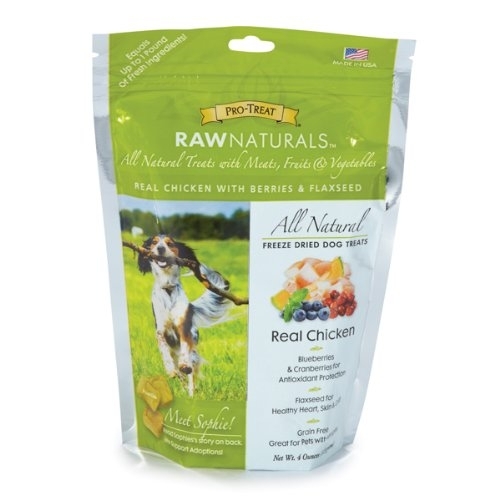 Each is freeze-dried to lock in freshness and flavor. 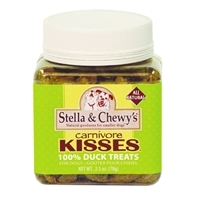 Stella & Chewy's Carnivore Kisses Freeze Dried Duck Treats 2.75 oz. 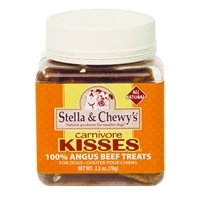 Stella & Chewy's Carnivore Kisses Freeze Dried Beef Treats 2.5 oz. 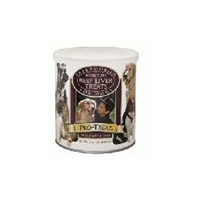 Pro-Treat Freeze Dried Beef Liver Treats maintain the aroma, full flavor, and nutritional value of raw beef liver. 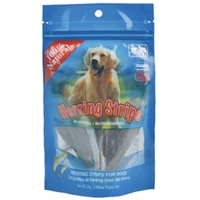 Conveniently cubed into reward size treats, they are an excellent obedience and training tool. Rich in protein. 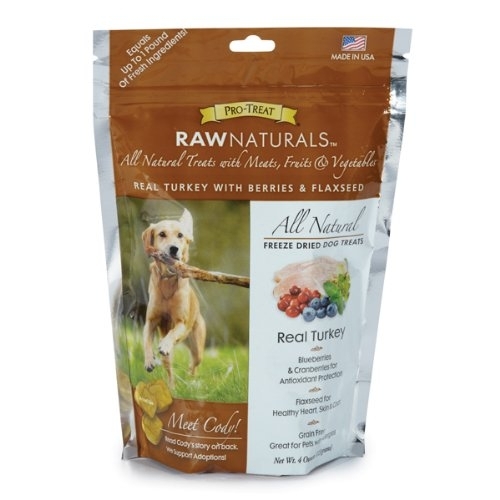 Turkey, Berries, Flaxseed Pro-Treat Raw Naturals 4 oz. High quality meat protein; antioxidant rich fruits & vegies, omega 3 & 6 rich flaxseed meal, 100% grain free, preservative free, all natural. 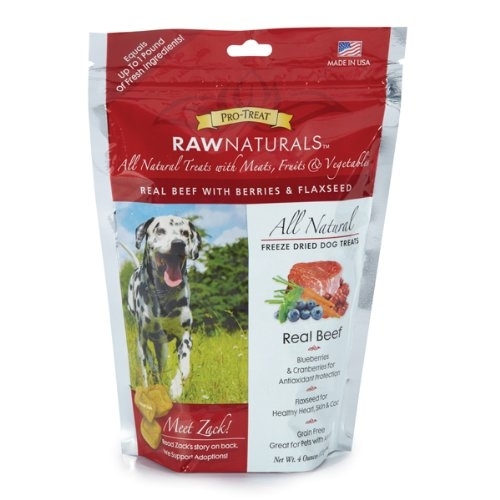 Beef, Berries & Flazseed Pro-Treat Raw Naturals 4 oz. High quality meat protein, antioxidant rich fruits & vegies, omega 3 & 6 rich flaxseed meal, 100% grain free, preservative free, all natural. 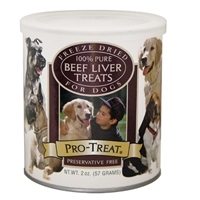 100% Freeze Dried Liver Beef Treats - great for puppies and obedience training. 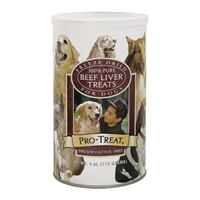 Contain the full flavor and nutritional value of the fresh raw liver. 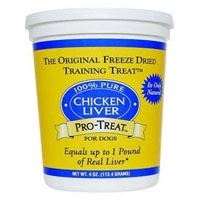 Gimborn Freeze Dried Chicken Liver 3 oz. 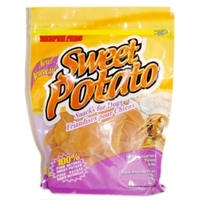 Delicious, all natural, dehydrated sweet potatoes are rich in vitamins as well as iron, calcium, fiber and betacarotene. Dogs love the sweet, satisfying taste! All natural, dehydrated sweet potato treats! 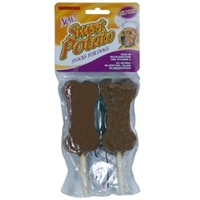 Rich in vitamins as well as iron, calcium, fiber, and betacarotene with Natural Rawhide Twist for a long lasting treat!